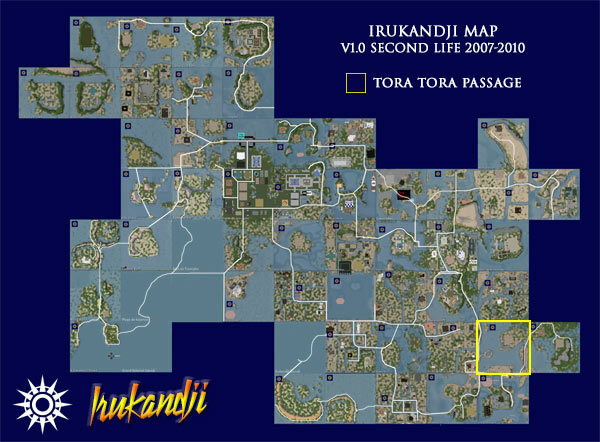 The simulator, Tora Tora Passage is a residential region in Second Life, located in Aboyo State in southeast Irukandji. Tora Tora Passage was one of three islands created simultaneously to form an L-shaped landmass surrounding Minoan Atolls. Its sister regions were Mount Aboyo Island and Cabria Island. 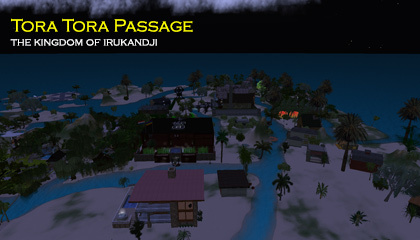 Tora Tora Passage is a flat region with small hills and large subdivisions. A broad section of the Aboyo River flows through the island, hence its name, and the lay of the land gives itself to homesteads. Tora Tora Passage never really took off, perhaps because it was the more land locked of the three islands, and although it did gain a reasonable population at one point, I made the decision to re-invent it as a light residential sea. Hence in 2009, Tora Tora Passage became Toraboyo Beach. Only one photograph survives of Tora Tora Passage, which is shown opposite.